7,000 sq. ft. artwork -- which has visually defined the Culver Plaza complex across Sony Studios and the Kirk Douglas Theater in Culver City -- will soon grace façade of Playa Vista educational institution. I hope once the painting is installed at its new location that it will invigorate viewers, and encourages a spirit in young and older students, campus visitors, and passersby to think and act boldly, innovatively and creatively in everything they do. 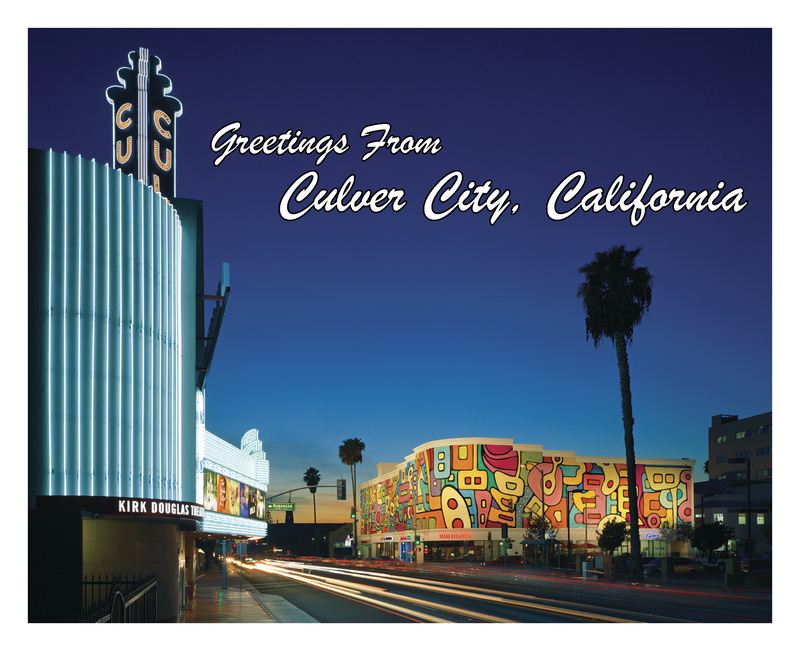 The Los Angeles -- Culver City gateway loses a signature visual landmark heading into the weekend as the Culver Plaza building complex -- uniquely identifiable by Ed Massey’s vibrant public artwork, "Syncopation" -- is demolished in preparation for mixed-use property re-development. Adjacent to Sony Studios and the Kirk Douglas Theater, the painting measuring 241’ long and 35’ high, will be removed in sections hours before the building demolition and transported to a Playa Vista educational facility where it will be installed in the coming weeks visually transforming the campus in a colorful palette of blues, yellows, oranges, and greens. 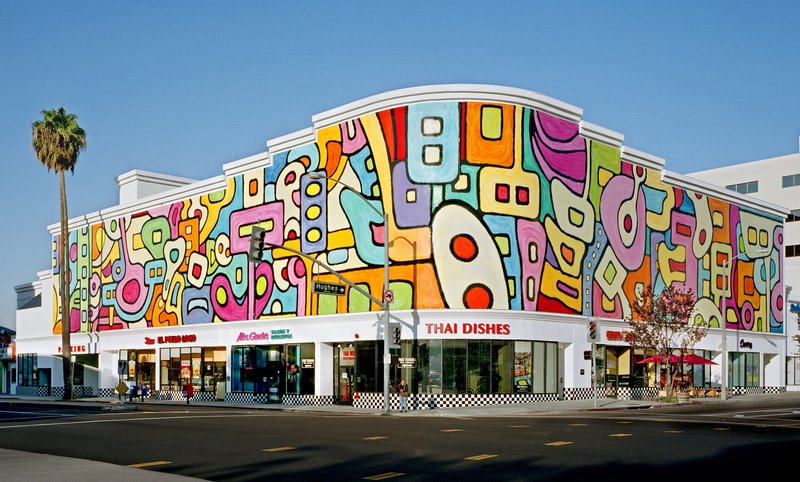 Since 2004, the highly visible "Syncopation" -- a monumental design of bold organic shapes -- has greeted vehicular and pedestrian traffic, diners, theater goers, studio and office personnel, and local business customers at the intersection of Washington Boulevard and Hughes Avenue in Culver City. Massey created the work specifically for the 9901 Washington Boulevard Culver Plaza complex, using mops as giant paint brushes on all-weather material. 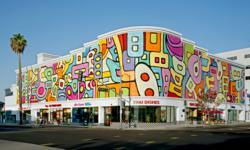 The completed painting was installed onto the building's curved exterior walls in 11 separate sections, visually energizing the environment and vistas of the area. When owners NMS Properties decided to build a new mixed-use building complex on the Washington Boulevard property, it became a winning proposition for the Westside Neighborhood School, which will give "Syncopation" a new location, environment, and viewership. In contrast to Culver Plaza, the new site for the artwork is directly at an educational facility, located in close proximity to Loyola Marymount University and area businesses. “I hope that once the painting is installed at its new location that it will invigorate viewers, and encourages a spirit in young and older students, campus visitors, and passersby to think and act boldly, innovatively and creatively in everything they do,” Massey said. Massey is no stranger to social impact and public art initiatives having conceived immense civic projects including "Garden in Transit," which transformed the New York City taxi fleet into a giant moving canvas, and the "Summer of Color" project, which turned all 156 Los Angeles County lifeguard towers from Malibu to Palos Verdes into works of art that involved thousands of children and adults in hospitals, schools, and social service programs. He conceives many public projects on behalf of Portraits of Hope, a civic and public art program that he co-founded. For more information please contact Rob Brown at 310-474-5141 or visit http://www.edmassey.com.